Where am I? - Just finished the day in Port Vila, capital of Vanuatu. Probably just finished dinner, relaxing somewhere, not having to think about writing a blog post to get live, what to paint on my nails the next day, or what dramas may be happening at work in my absence. We are past half way with my series of guest posts, but there are still so many fantastic posts to come. Tonight's post is from Casey from Drama Queen Nails. 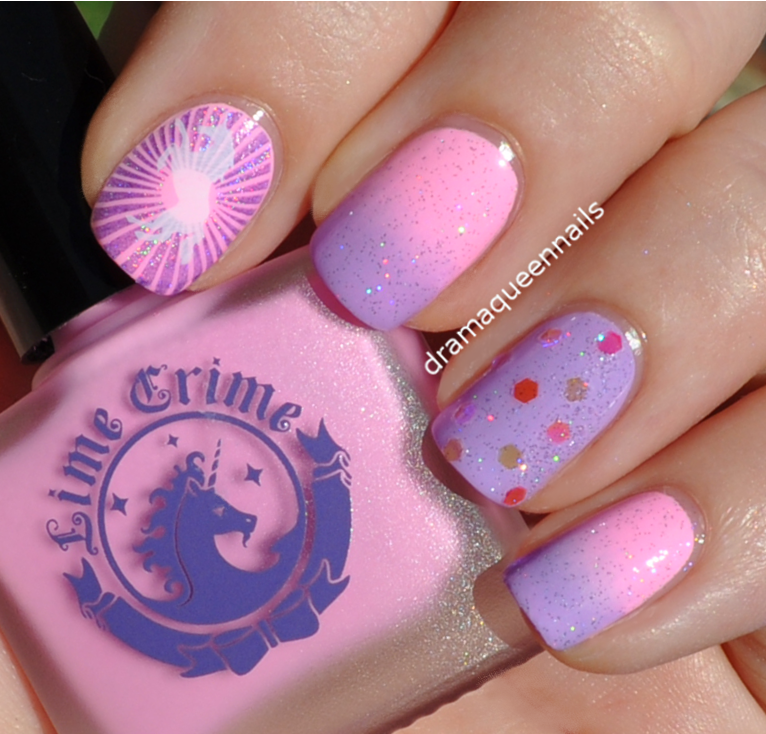 She has created a mani design that I don't wear often, something girly and pretty with unicorns and sparkles. Go for it Casey. Hi everyone! This is Casey from Drama Queen Nails. Thanks so much More Nail Polish for inviting me to be a part of your guest post series. I remember having a moment at my laptop when I stumbled across More Nail Polish for the first time. Apart from being dazzled by the stunning photos, great reviews and unique nail art, here was an Aussie girl with the most amazing polish collection. Could it be true? Could a polish starved Aussie girl like me be able to own these polishes too? After years of being limited to brands found in chemists and cosmetic shops More Nail Polish was a gateway to whole new world of polish never before seen in Australia. While my bank balance is yet to recover, my ever growing polish collection is magical and sparkly, just like a unicorn! For those who don't know me I have been into nail polish since I was really little. I started playing around with nail art about 2 years ago by watching water marbling videos on Youtube. After many failed attempts at that I gradually started seeking out easier alternatives to experiment with. As I mastered the gradient and my confidence grew my lust for all the polishes began. And then I discovered stamping....I was hooked! I just got these 2 Lime Crime Polishes, they are the first in my collection. I was super excited to try them out after seeing swatches on IG. The purple is Lavendairy and the pink is Pink Parfait. Lavendairy is a creme polish that is opaque in one thick coat. Its a great formula, and such a nice colour. The opaque baby pink creme is a little unforgiving on application. Its a bit streaky and erases itself, but after two thick coats it dries to a matte finish. They worked really well for the gradient, I didn't need to use white underneath them, just one thick layer of the pink. I love the Lime Crime bottles, too cute! I had to find a unicorn to match the bottles...it just seemed right! I used 2 Winstonia plates for this design. W111 and W117. I used Color Club - Eternal Beauty for the rays and Konad white for the unicorn. Love that the Color Club holographics stamp so well. I topped off the gradient with Out The Door - Northern Lights. The glitter accents are hex ice (see through) glequins. 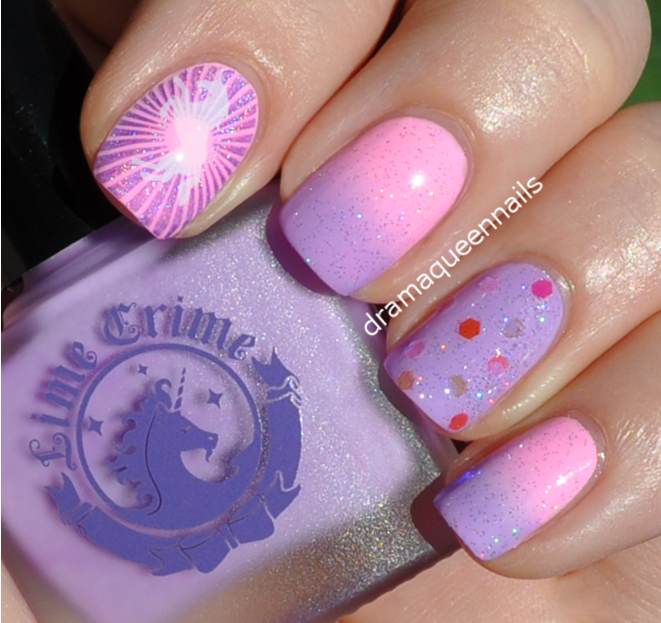 The gradient is gorgeous but that unicorn is just freaking amazing! The gradient nails are phenomenal! So girly I love it! This is just the sweetest mani ever! Love the whole look! Girly and sweet and a Unicorn!! Who doesn't love a Unicorn?? Thanks everyone for your kind words.....happy girl!